NordicTrack Freestride Trainer Fs7i Review by Industry Experts! Getting the right elliptical for your body and budget! The Freestride Trainer Fs7i by NordicTrack is On Sale! FreeStride Training – Defining Your Own Motion and Exercise! Price Alert: This is $200 OFF the Regular Price! The NordicTrack FS7i is reinventing the concept of cross training with the ability of defining your own motion and exercise. NordicTrack has been pushing this model heavily so we were happy to have the opportunity to review the NordicTrack Freestride Trainer FS7i when we visited their headquarters. The combination of the promotions and the word of mouth have made this machine one of NordicTrack’s hottest sellers. The concept behind the FreeStride Trainer FS7i is that you have both a free style and variable motion, which offers numerous advantages over your typical elliptical trainer. Similar models are the FreeStride Trainer FS9i and FS5i. MID-WEEK SALE ENDS THURSDAY: The NordicTrack FreeStride Trainer FS7i is reduced to $1,799 with Free Shipping. Financing is available. An excellent value.This is $200 OFF the Regular Price! Variable Motion — The FreeStride Trainer FS7i lets you set your stride path so that it works best with your body. This is better than being locked into a set pattern. When your exercise follows a set pattern, as is the case on an elliptical trainer or a treadmill, your body adjusts and consequently the benefits are minimized. With the “FreeStride” motion you have “muscle confusion”, where you confuse your muscles with variation. The NordicTrack FreeStride Trainer FS7i lets you simulate exercising on a stair stepper, elliptical trainer and a treadmill. This allows you to target various lower body muscles. 32” Stride Length — With an elliptical trainer you are typically locked into a 20” stride length, and once again your body adjusts. With the FS7i you have the ability to stretch your stride to a lengthy 32”, so you define the length of your stride not the machine. The 32” stride length is also advantageous for multiple users of various heights. Incline Feature – To further enhance your workout you can incline the motion of the Freestrider Trainer FS7i. This gives the benefit of further targeting additional lower body muscles and cranking up your cardio burn. Upper Body Workout — Like an elliptical trainer you have handlebars to simultaneously exercise your upper body. To mix up my workout and target different muscles, we typically will alternate our resistance exercise between legs and arms. Create customized workout routines focused progressive and include audio coaching. Trace routes on Google Maps and the Freestrider Trainer FS7i will simulate the terrain. Upload videos of famous landscapes and cityscapes to your FreeStride Trainer. Your exercise stats are downloaded to your iFit.com account where you can track your progress. Note: At the time of this posting, the FS7i comes with a FREE 1-year iFit Membership with your initial purchase. This is a great value! Check out a comparison article for the FreeStride Trainer FS7i and FS9i models here. 7” Smart HD Touchscreen – This display provides brilliant feedback on your stats and full color interaction with iFit Live. This does not include web browsing capability. 20 Lb. Flywheel — The heavy weight of the flywheel gives the motion a smooth and natural feel. Center Drive — Because the mechanics are located in the center of the machine and not the front or rear, it is more compact. The FreeStride Trainer FS7i has a length of 68”, in comparison to, for example, the Sole E95 elliptical trainer which is 83”. Read more about the differences between front, rear, and center drive machines here. Incline and Resistance Controls in Moving Handelbars – We particularly like this feature. You can change up the resistance and incline without having to release the handlebars, which means you don’t have to break your stride to make adjustments. Easy Assembly — The company states that their “Snap Assembly” design will cut the assembly time in half. We have not assembled a FreeStride Trainer, so we cannot confirm this, but anything that makes assembly fitness equipment easier is a blessing. See a complete comparison chart of all NordicTrack Ellipticals here. Speakers and MP3 input. The sound is better than found on most fitness equipment. Lifetime frame and motor, 5-year parts and 2-year labor warranty. Standard coverage at this price range. There are several commercial fitness equipment companies that are offering a similar type of variable, free stride machine in health clubs. Typically, when a user first gets on one they find them awkward, but before long they are addicted and the machine becomes their fitness equipment of choice. The company told me the feedback has been very positive, and as mentioned, the FS7i FreeStride Trainer is one of NordicTrack’s biggest sellers. We like the ability to define your stride length and motion to your preference, but when you combine those features with the full color web enabled monitor and motivational, you have a winning formula for achieving your fitness goals. You may also wish to check out the NordicTrack FS5i and FS9i. I have had an elliptical in the past, we were in the market for a treadmill after checking out what Nordic track had To offer this was the best of both. I love that you can change the motion and direction of your step or stride on the fly. It makes for a better work out without over doing any particular muscles. Keeps the workout fun! Don’t take long to work up a sweat and know you are getting your money’s worth. Go to www.NordicTrack.com and learn more! IFIT Live does have an additional cost. No problem with varying height individuals using the Freestrider. I have read that the handles on the freestrider are large and uncomfortable to hold on to for any length of time. Has this been a common problem? Are there any suggestions for this issue? I use a freestride machine routinely and I haven’t noticed it being an issue for me personally. What is the max recommended height without being bent over, and what is the max foot size of the foot cradle ? Please, I need exact numbers, not just “no problem with varying height…” Also, what is the weight capacity? User weight capacity is maximum of 375 lbs. Regarding the foot cradles I’ve never seen a 375 lb person (or under) with feet that wouldn’t fit. On your question about max recommended height, the pedals are approximately 18″ from the ground so you can add 18″ to however tall you are to determine minimum ceiling height requirement. Let me know if you have additional questions or if I didn’t answer something clearly. I want to get the Freestride FS9i but need to know how much room is needed front to back when in full stride? I know the base is 61.9″ but when I have one leg all the way forward and one leg all the way back I don’t know if it will work in the space I have and cannot fine this measurement listed anywhere. Does IFIT control resistance/incline based on heart rate? Or, will IFIT communicate with an fs7i program to adjust resistance/incline based on user heart rate? Great Question regarding iFit Live. Your heart rate is not associated with resistance and incline. The iFit program will adjust the resistance and incline based on the terrain of the routes you choose. I notice the SE9i (and SE7i) have a tablet holder. Do the Freestrider models have tablet holders, too? Great review! Especially appreciate the video. Looks like a great product. I’m trying to decide between the FS7i and the SE9i elliptical. For someone having limited workout experience, how challenging is it to use the Freestrider? Is changing between elliptical, treadmill, and stepper modes intuitive? If I want to use it as an “elliptical” for a period of time, will it be difficult to keep in in that mode? Or do modes blur with this product? I *really* like what I see; ultimately, however, I don’t want to invest in something that will be too difficult or ineffective to use. Thanks for your question regarding the FS7i. I personally prefer the Freestrider over a conventional fixed pattern elliptical. The local gym I go to has a Precor commercial machine called “Adaptive motion Trainer” which sells for around $8,900. The AMT is my machine of choice for my cardio workouts… I love what Nordic has done with this machine as it operates on the same ‘free stride’ principle, and doesn’t cost anywhere near $9 Grand. The FS7i has my vote for sure..love this machine. The location where the equipment will be placed in my home has a ceiling height of only 7’1″. I’m 5’11”. That’s a difference of 13″. From what I’ve been able to determine, the FreeStrider requires 15″ clearance. Looks like the SE9i — which requires only 13″ of clearance — is my only option. Hi Chris, I need to verify those specs with inside rep at NordicTrack but it sounds accurate. The pedals on the FS7i are slightly higher from the ground in comparison to the NordicTrack SE7i Elliptical. Make sure before you order from NordicTrack that you click on the live chat and ask the online sales person about clearance requirement on whatever model you decide. You definitely don’t want to order a machine only to find out your space requirement clashes. So, I will have to assemble it myself? They don’t offer assembling? At check out with NordicTrack, I believe there are options for delivery and set up. You can pay extra for professional assembly if you want. NordicTrack and other reviewers of the FS7i claim that set up is fairly easy. I am generally handy and capable of following installation and set up instructions. Can I (should I) save the $249 for professional set up? Machine assembly isn’t difficult but the box is very for one person to move around after it’s delivered. How much is the 1 year subscription to use the programs to do the workout for Nordic Track Free Stride FS7i ? What is its use without it? Would I be lost with out the subscription? In previous years, you could purchase the machine and iFIT live was optional. However, Nordic has improved the technology so much that’s it’s now an integral part of the machine operation. At this time, you can’t purchase the FS7i Freestrider without the iFit subscription, it is required as part of the purchase price. The FS7i dimensions are listed as 68 “ L x 28.5” W x 62” H. Do these numbers represent the full workout space needed? Or are these the dimensions when it’s in storage mode? I’m interested in a smaller footprint when the machine is not in use. Hi Andrea, I show the dimensions as 57.3″ Length requirement for stride operation, 68.5″ Height to top of the screen overall dimensions. Is there an option to stop the handlebars from moving back and forth when in use? The handlebars move in conjunction with the pedals. Just bought the FS7i after discussion with the Nordic Track rep. Also bought 3 years of I Fit. I have used an older Nordic Track Pathfinder elliptical for the last 2 years and my wife wanted to join in but didn’t like the elliptical so we decided to take the plunge (my daughter layed claim to the Pathfinder). Impressions? It’s a BIG box in delivery and takes awhile to set up but if you can follow directions assembly is not hard. The screen is a bit smaller than I hoped but VERY clear and colorful. You are so close to it working out that it probably doesn’t matter. The onboard video workouts are great and when the automatic incline kicks in you will be amazed. They IFit programs on it take some time to figure out so be patient. The increased stride from a standard elliptical is really noticeable when you get deep into a program. The handles ARE large and a bit annoying but I’m sure over time I will get used to them. There are tons of both resistance and incline levels so you will have no problem with that. I have only used it about 5 times but overall I am excited about this machine. Extremely well built. I appreciate the reviews and just watched the 2018 Best Buy Ellipticals, which recommend both the Nordictrack Freestrider and Sole Ellipticals- the two I’ve been trying to choose between. I’m interested in the hybrid movement the Freestrider FS7i provides but I also like the sturdiness / flywheel weight of the Sole E95. Would either work for longer use (training for a couple hours per use) with daily frequency? Either machine will get the job done for you but the FS7i is more versatile. I am just 5′ tall. Will the stride work ok for me? I’ve seen some reviews that say the stride length is a little too long for a shorter person and might be uncomfortable. Help. It’s a variable stride length so you can go as small as you want, or up to 38″. I don’t think you are going to find another machine with these capabilities at this price point. what is the weight FS7i ? what is the total length requirement needed for full stride on the FS7i? 1/ If I buy the FS7i, you say I HAVE TO purchase the iFit program, is that correct? 2/ If I buy it along with the iFit and I do not want to use the iFit can I still operate the machine? 3/ If the iFit stops working (due to an internet outage or power outage) does the machine continue to work? 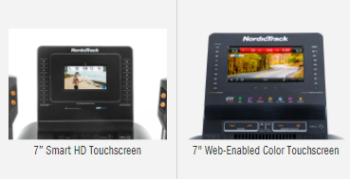 1) Currently NordicTrack has a promotion on teh FS7i and iFit is included in the price for one year. You do not have to purchase a separate subscription. 2) You can still operate the machine without iFit. 3) Power is required to operate the machine. We'd love to hear from you. Feel free to ask questions or post your own review. Your email address will not be published.